Published Apr 12, 2019 by Addison-Wesley Professional. Part of the LiveLessons series. Amazon Machine Learning LiveLessons is designed to provide a solid foundational understanding of the data preparation and evaluation that’s necessary to run predictive analysis with Machine Learning models. The course covers the concepts necessary to understand Amazon Machine Learning and teaches the user how to leverage the benefits of predictive analysis. Usage scenarios are provided to inspire viewers to create their own value-added services on top of Amazon Machine Learning. 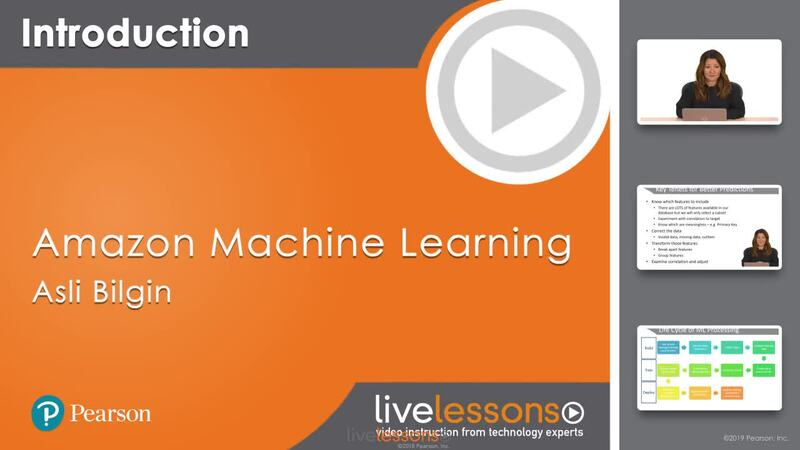 Amazon Machine Learning LiveLessons contains more than 20 independent video lessons totaling more than 3 hours of instruction with demos, interactive labs, and detailed slide explanations. Hands-on labs with Amazon Machine Learning are included to provide necessary context and experience to create pragmatic applications. Viewers will walk away with a solid understanding of how Amazon Machine Learning is structured and how to apply it in their own scenarios. Asli Bilgin’s knowledge comes from her unique experience working at Amazon and as a Machine Learning consultant for her business, Nokta Consulting. She uses her professional skills for her personal vintage jewelry business, oyacharm. She is an award-winning cloud computing executive who has more than two decades of experience working for companies such as Dell, Microsoft, and Amazon. She specializes in IT transformation and modernization leveraging disruptive technologies. At Amazon, Asli created, launched, and ran the global Software as a Service program and ran the Financial Services IT Transformation practice for AWS Professional Services. At Microsoft, she led the cloud and web strategy for 80 countries in the Middle East and Africa, based out of Dubai. In her early career, Asli served as a software developer, technical manager, and architect for large and complex enterprise projects. IT technologists and hobbyists, computer science students, and domain experts who want to understand the basic principles of Amazon Machine Learning and its application and receive a hands-on practical demonstration of using Amazon Machine Learning. You don’t have to be a data scientist or professional developer to benefit from this course. In fact, small business owners who have a firm handle on their own business data would find value in the examples used, which is a retail business and small dataset. Familiarity with technology consoles and administrative interfaces would be very helpful. A rudimentary understanding of the Amazon Web Services platform would be a bonus, but not necessary to learn from this course. A basic understanding of how data and its schema is structured digitally would be an asset to understanding the concepts of Machine Learning. Module 1, “Amazon Machine Learning Basics,” discusses understanding how Amazon ML works and how you can frame problem sets. By the end, the first data set will be uploaded. Module 2, “Amazon Machine Learning Data Architecture,” covers how to set up the source from SQL Server. The data to be downloaded will be provided, so SQL Server does not need to be installed. In Module 3, “Data and Schema Configuration,” historical sales data is used to predict the future price of an item. “Gotchas” are showcased so a solid starting machine learning model can be built. Module 4, “Machine Learning Visualization and Modeling,” uses data insights to further refine the model. Module 5, “Predictions with Amazon Machine Learning,” examines predictions and determining future data. The model’s performance is analyzed, and real-time and batch predictions are applied. Finally, key concepts, questions to consider, and next steps are covered. Pearson publishes expert-led video tutorials covering a wide selection of technology topics designed to teach you the skills you need to succeed. These professional and personal technology videos feature world-leading author instructors published by your trusted technology brands: Addison-Wesley, Cisco Press, Pearson IT Certification, Prentice Hall, Sams, and Que. Topics include IT Certification, Network Security, Cisco Technology, Programming, Web Development, Mobile Development, and more. Learn more about Pearson Video training at http://www.informit.com/video. Lesson 2: Which Use Cases Can Amazon ML Solve? Lesson 3: How Does Amazon ML Work?